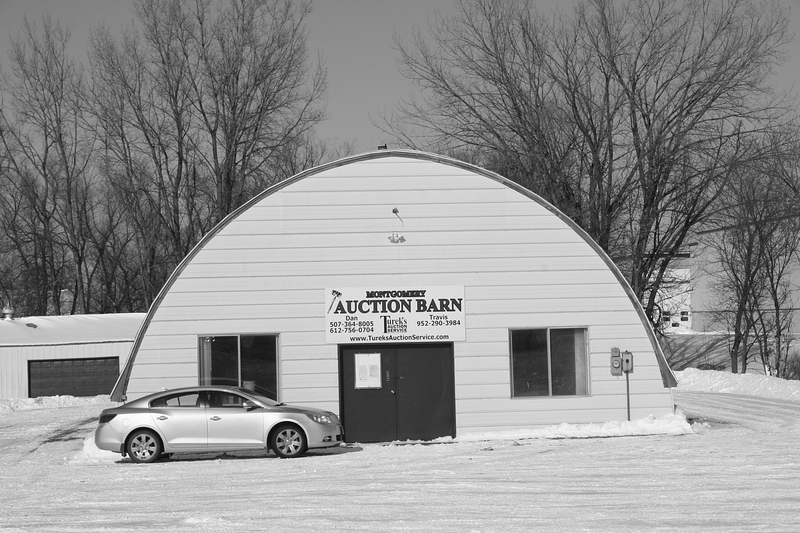 Turek’s Auction Service, 303 Montgomery Ave. S.E. (Highway 21), Montgomery, has been “serving Minnesota since 1958.” Daniel Turek, Sr., started the third-generation family business now operated by Dan, Jr. and Travis Turek. They sell everything from antique vases to real estate. YEARS, MAYBE EVEN A DECADE or more, have passed since I attended an auction. But once upon a time my husband and I frequented auctions, bidding mostly on furniture. Our prized dining room table came from a neighbor’s household and farm auction back in my hometown of Vesta. The matching chairs were from a sale near Morristown. Auctions appeal to me for many reasons. There’s a certain camaraderie yet competitiveness, friendliness yet aloofness, thrill yet disappointment. When you outbid someone or snare merchandise at a bargain price, it’s a heady feeling. But it’s more than that. The rhythm of an auction, the mesmerizing cadence of the auctioneer’s voice, the slight nod of the head, the closeness of the crowd, the commonality of community, Styrofoam cups brimming with steaming coffee, all create an unforgettable experience. Perhaps it’s time I attend an auction again. 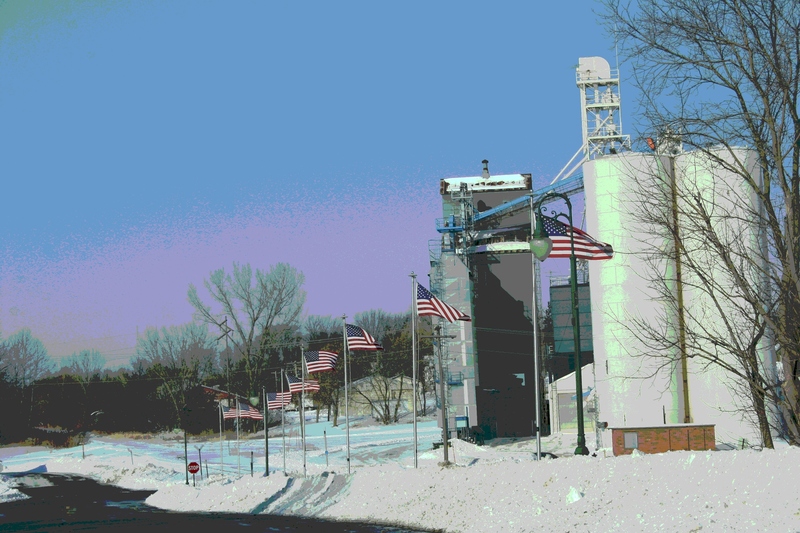 American pride along First Street, Montgomery, Minnesota. Those words imprinted upon my memory, instilled a sense of pride in my country and a realization that I live in a nation blessed. Precious words. Somewhat muddied now. But still, ever so dear. 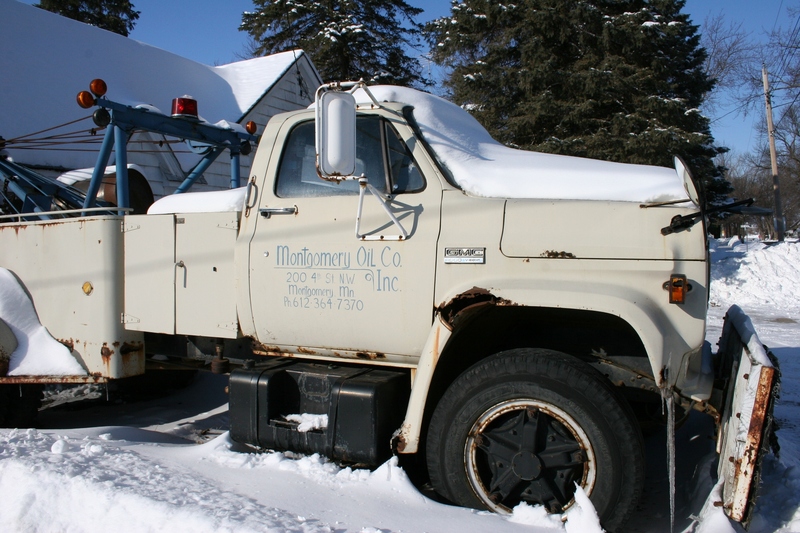 A Montgomery Oil Co. tow truck photographed recently along a residential street in Montgomery, Minnesota. Is this the former site of the service station? DO YOU EVER WONDER, like I do, about the stories a vehicle could tell? 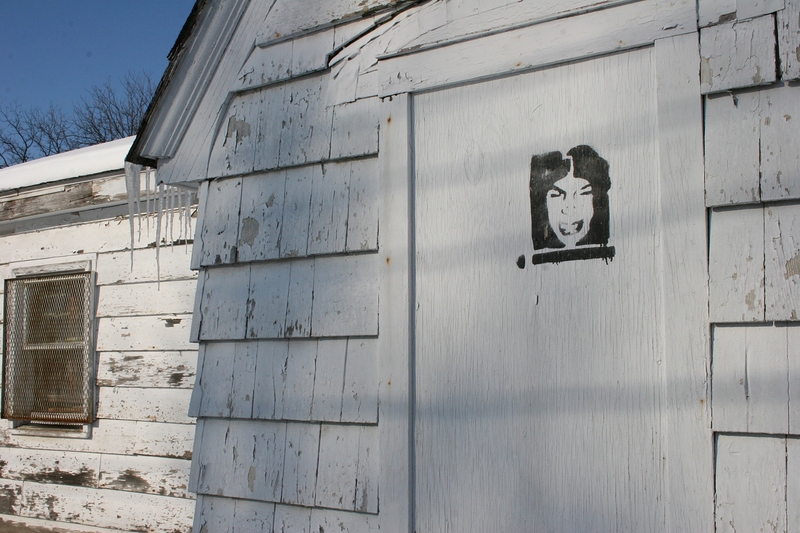 Why is this face painted on a door of the building where the tow truck is parked? And whose face is this? I suppose it’s the former news reporter in me or that natural curiosity I’ve always possessed that fuels my mind to frame questions. 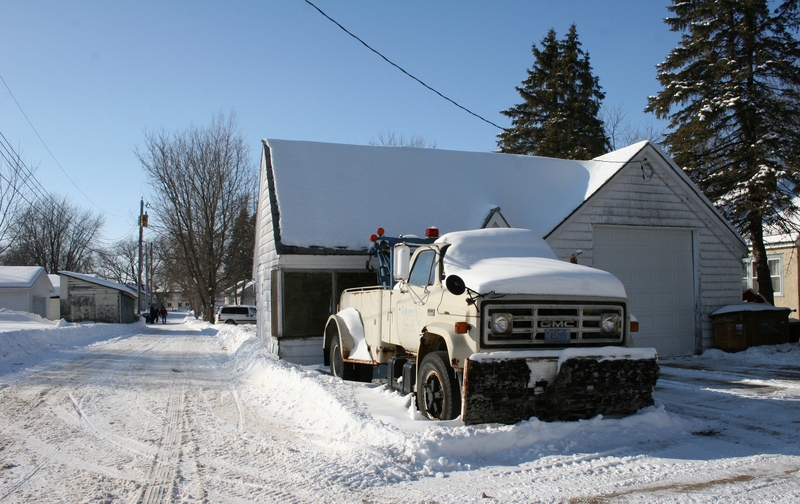 How often did this truck travel, after bar closings, to tug a vehicle from a ditch near Montgomery, Minnesota? And how many tragic scenes—shards of glass scattered across the highway, crushed metal, flashing lights—has this tow truck viewed? Has this truck’s driver cursed when the phone rang in the wee hours of a brutal winter morning? It appears, from the snow locking in and blanketing this truck, that it hasn’t moved in awhile from property along a residential street in Montgomery. West Side Park sits right across the alley. Is this tow truck the planned project of a restorer or simply abandoned, destined to rust away in this spot an alley away from a small town Minnesota city park? NO MATTER THE SEASON, no matter how many times I’ve viewed Shattuck-St. Mary’s School through its arched entry, I remain impressed by the incredible beauty and strength of this place. 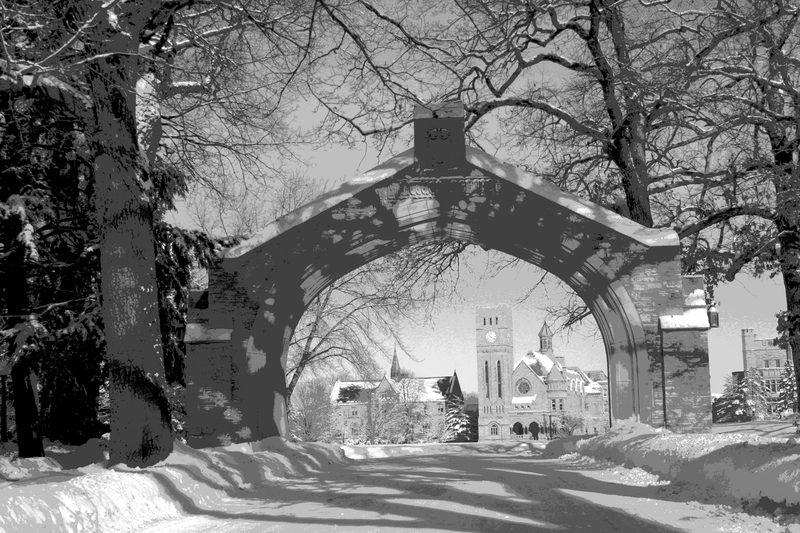 An arch frames Shattuck-St. Mary’s School in Faribault, Minnesota. Tucked into Faribault’s east side, Shattuck’s campus seems more Ivy League college or an American version of Hogworts than an historic private boarding school in Minnesota. But it is here from whence eight 2014 Sochi Winter Olympics hockey players graduated: Brianna Decker, Amanda Kessel and Jocelyne and Monique Lamoureux playing for Team USA; Zach Parise and Derek Stepan on the men’s Team USA roster; and Sidney Crosby and Jonathan Toews competing for Team Canada. TODAY MY HUSBAND AND I had these wonderful plans for a one-day respite from winter. We intended to drive to St. Paul, tour the Como Park Conservatory and then have lunch with our eldest daughter and son-in-law at their Lowertown apartment. But that all changed after we decided to heed the Minnesota State Patrol’s advice to avoid unnecessary travel this weekend. 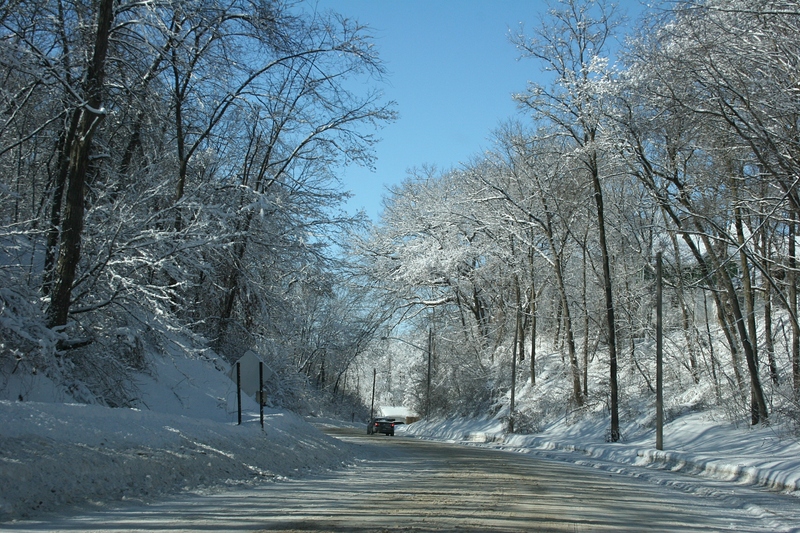 In the aftermath of Thursday/Friday’s blizzard, roads remain treacherous. Rain followed by snow caused a layer of ice to form under the now snow-packed roadways. Yesterday’s traffic situation in the Twin Cities metro was awful with thousands of spin-outs, nearly 700 crashes, almost 1,000 stalls and over 50 jackknifed/stuck semis, according to numerous news reports. 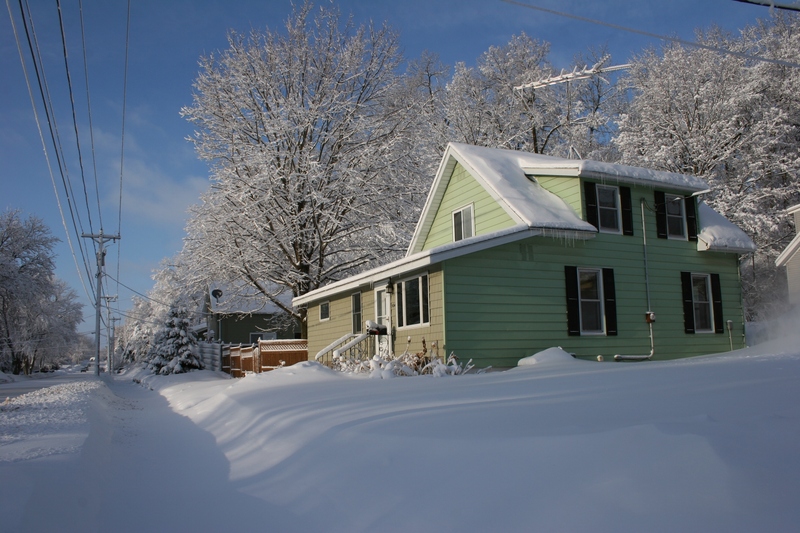 The situation in areas of outstate Minnesota has been equally as challenging. Conditions have been termed the worst in 25 years. Minnesota Highway 60 just east of Faribault Saturday morning shows a mostly snow-packed and icy highway with a few patches of pavement showing. In the cold that followed the storm, salt and chemicals are not melting the snow and ice. Roads will improve only with time and we’re told that could be days. 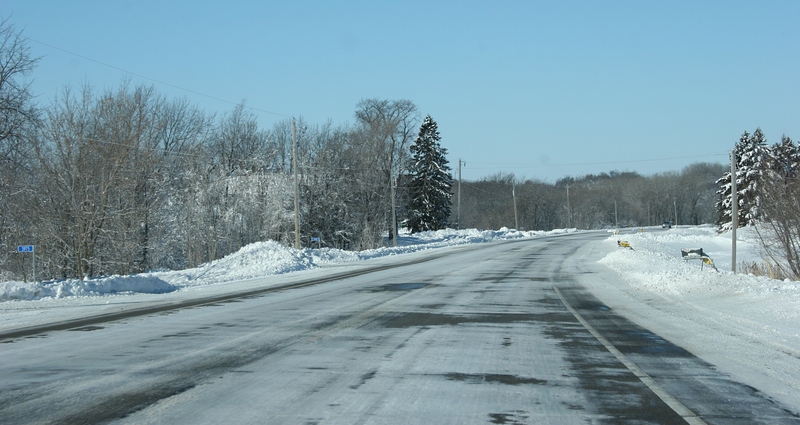 A short drive east of Faribault along Minnesota Highway 60 this morning showed us just how bad roads are. We did not want to be part of the metro mess, thus the decision to postpone the St. Paul outing until another weekend. And, as our eldest daughter reminded us, we did not want to be the second Helbling to go in the ditch this week. 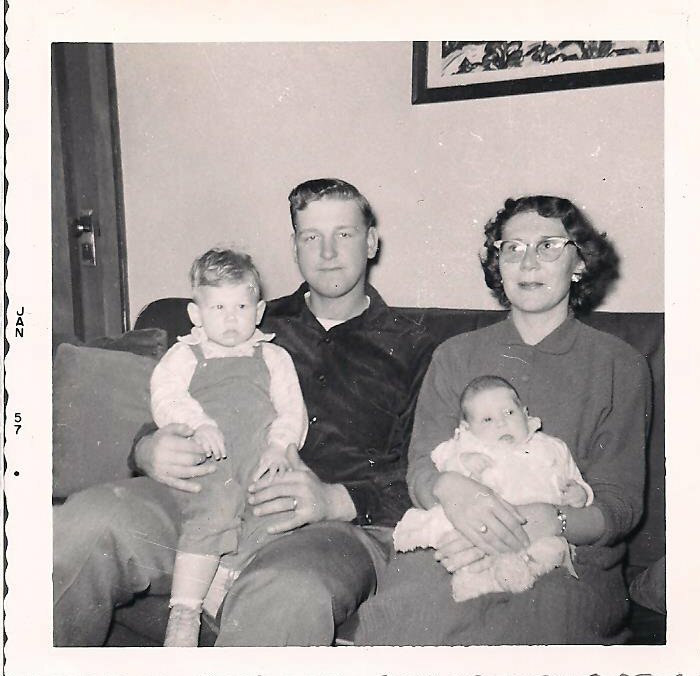 Monday morning our second daughter’s vehicle hit an icy patch on a rural Wisconsin roadway, spun around twice into the oncoming lane and landed in the opposite ditch facing the opposite direction from which she’d been traveling. Thankfully, she was not injured nor her Chevy damaged. There was no oncoming traffic. Her car did not roll (as she suspected it would) and it landed in the opposite ditch away from telephone phones. She did, however, have to crawl out the window as snow was banked against the door. Yes, this has been quite the winter here in the Midwest. 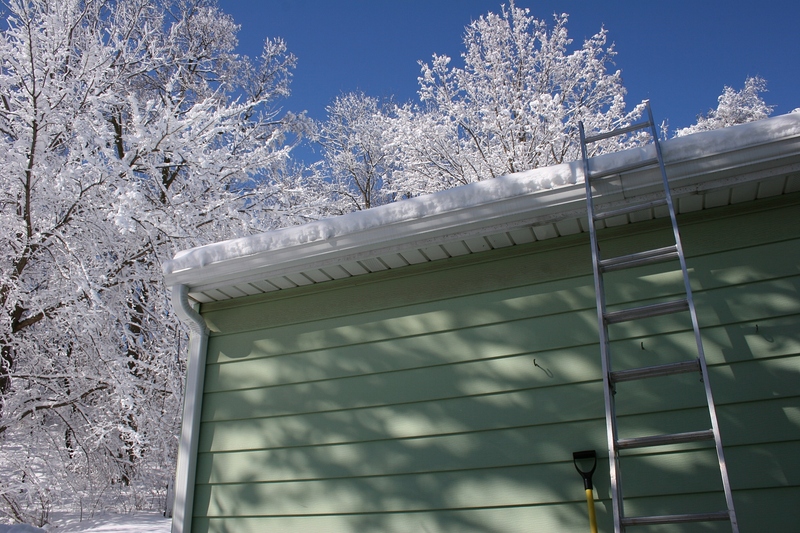 Preparing to shovel snow from the garage roof. Trees in my neighborhood are still laden with ice and snow. So, today instead of meandering among fragrant lilies, beautiful pansies and more in the balmy warmth of the Como Conservatory and then lunching with our daughter and her husband, we’ve been dealing with snow. My spouse has been shoveling snow from the house and garage roofs and from ours and the neighbor’s driveways. Ravine Street in Faribault this morning. We may head downtown again later. But we’re not leaving town. THERE’S NO DENYING the beauty of Minnesota’s latest snowstorm blizzard, which dumped perhaps eight inches of snow on Faribault. I’m never good at judging snow totals. 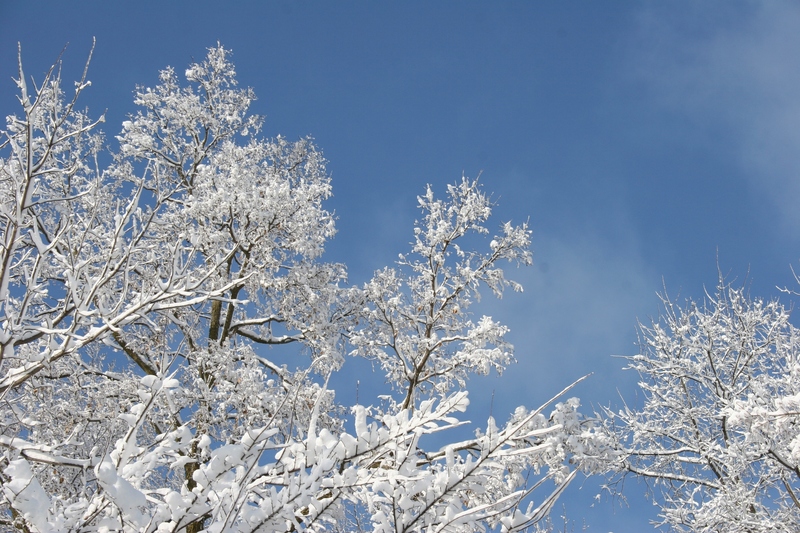 Heavy, wet snow layers upon trees and power lines, creating a surreal world of incredible beauty contrasted against a cobalt sky. The snow-coated woods behind my house are beautiful this morning. But beauty will take winter only so far. 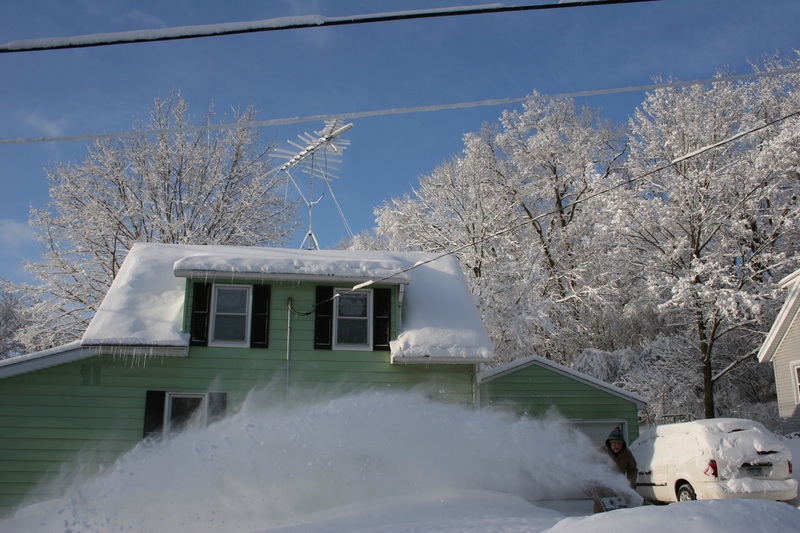 From my fenced backyard, I photographed my neighbor, Bob, blowing snow this morning. Faced with snow removal, I find that beauty quickly fades. As much as I appreciate the hard-working snowplow drivers, I don’t like digging out the snow they plow onto the ends of sidewalks (shown here) and driveways. 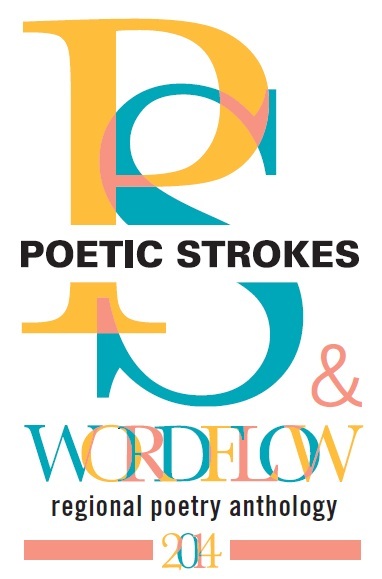 Sometimes it can be blown out, oftentimes not. This storm, my husband and I took a two-step approach to getting the snow off our and a neighbor’s driveways and sidewalks. 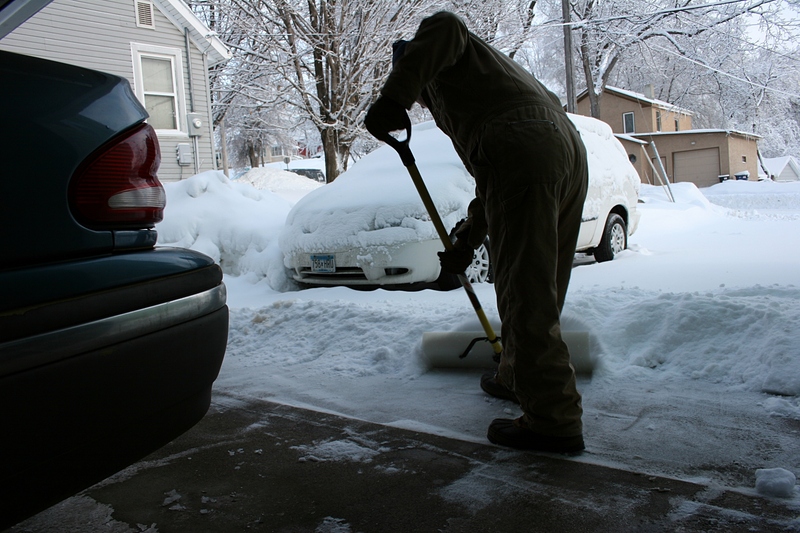 I initiated the plan Thursday afternoon when I realized Randy would never get the car through the snow at the end of the driveway upon his return home from work. 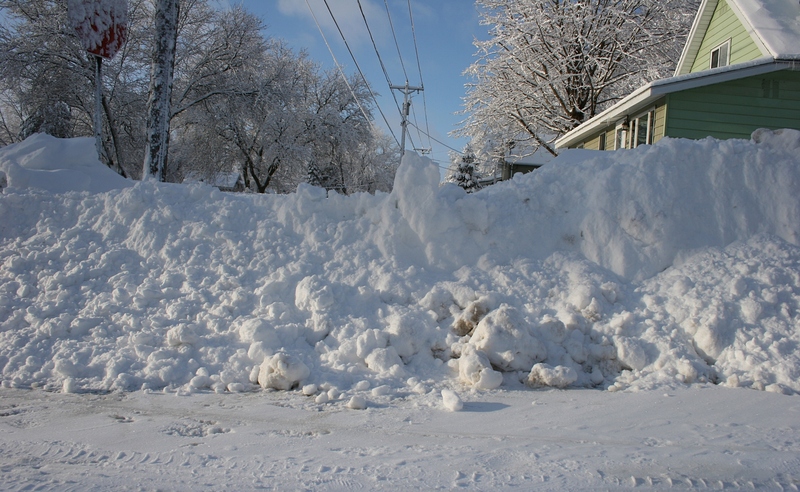 The snowplow had gone by, creating a wall of ice and snow chunks. Miracle of miracles, Randy actually arrived home at 5 p.m., 45 minutes earlier than usual. The boss said if he had to leave early, he could. He commutes to Northfield, 22 minutes distant, on a good day. 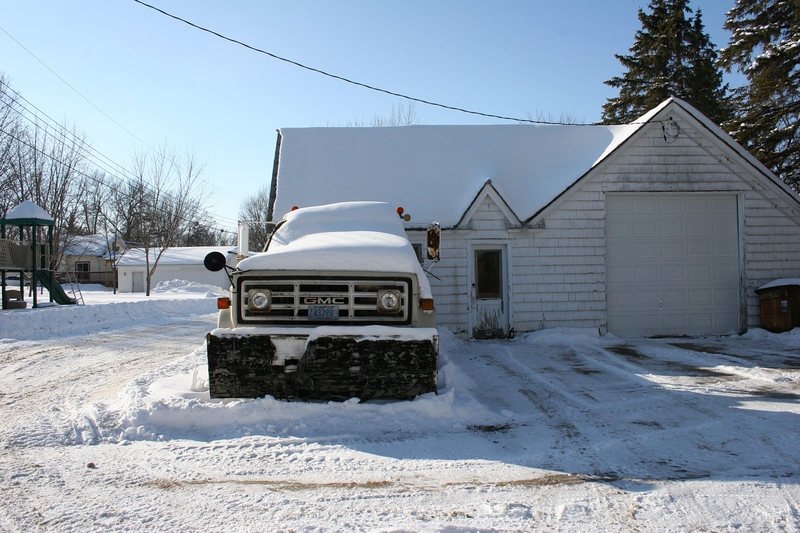 Randy opened the garage door this morning to continue the task of snow removal, phase II. 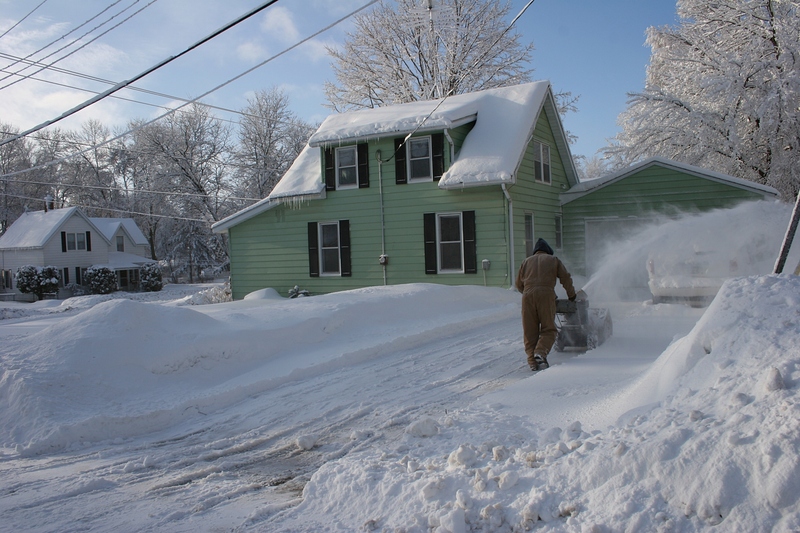 I had been shoveling for 30 minutes already when my spouse pulled out the snowblower. Our goal was to keep ahead of the storm somewhat. Shovel and blow Thursday and then again Friday morning. Nearly done clearing our driveway Friday morning. And so here it is, nearing noon on Friday. The driveway and sidewalks at our home and our neighbor’s place are cleared, were cleared, by 9 a.m.
A scoop shovel worked best for removing this snow. I shovel where the snowblower can’t go or can’t handle. My back, leg and arm muscles feel it. 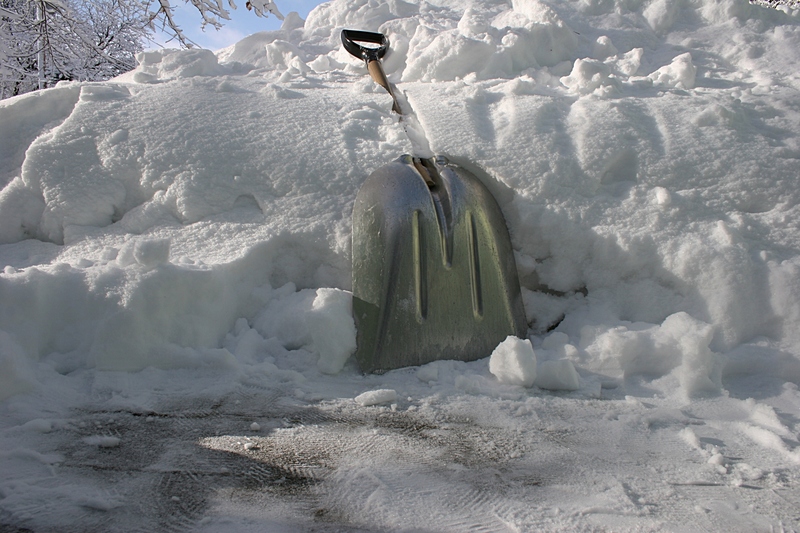 I’ve shoveled way too much snow this winter. 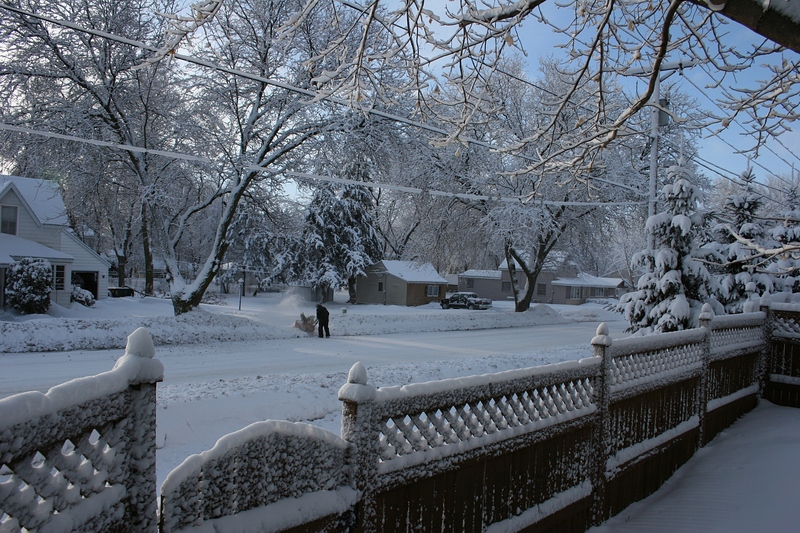 Snow flies as Randy works the snowblower down the driveway. Fortunately we are not without power, although the lights flickered numerous times Thursday evening.